It's not easy being an Android tablet these days. The iPad is the supreme ruler of the market, leaving but a small part of it to the huge number of competitors. So even if the Galaxy Tab 10.1 manages to successfully tackle a few dozens of devices running the same platform plus a few exotic competitors, the best it can hope for is go at the number two spot. But that's not necessarily bad - Rome wasn't built in a day and Samsung is certainly under no illusion that it will manage to knock Apple of its tablet perch with a single device. Apple took a gamble with slates, it worked and now they have the advantage in a rapidly expanding market, while the competition is playing catch up. Now we are not saying Apple cannot be beaten at its own game - most recent smartphone history suggests otherwise. We are just saying that some serious preparation is required if such a thing is to happen. Convincing customers that you can beat the iPad hardware or software isn't enough - you need to convince them that you can match or outdo the Apple user experience. And from where we stand after we completed the review the Galaxy Tab 10.1 can be a pretty strong argument for both Samsung and Android. And it's not just the really good PLS TFT display with Gorilla Glass, the powerful Tegra 2 chipset or the excellent connectivity (though those all score points for it). It's more the case of the Honeycomb 3.1-running slate being the most complete offering we've seen from the Android camp to date. The Samsung-made TouchWiz UI takes the already great Honeycomb functionality another level up, while the 3.1 Android update brings an overdue performance boost. Meanwhile app numbers are growing by the day and as we know apps are the heart of every tablet ecosystem. And if the ones you need haven't come out in tablet flavor just yet the excellent video player will still make your Galaxy Tab 10.1 great fun. 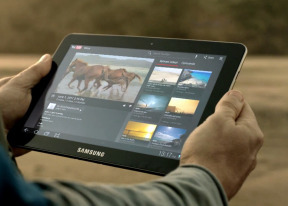 So that's the Samsung Galaxy Tab 10.1 summarized - it’s a nice tablet that no one would mind having around. What's even more we doubt anyone will regret spending €500 (for the Wi-Fi only version) €600 (Wi-Fi + 3G) on it. If you aren't quite convinced though, you might want to try some of its alternatives. The recently released LG Optimus Pad costs a good deal more than the Galaxy Tab 10.1 and has no fancy TouchWiz UI to brag about, but comes with one of a kind feature - stereoscopic 3D video recording (it also does 1080p videos in 2D). If you are really into this thing, then the Optimus Pad might be your only option. The first Android Honeycomb tablet - Motorola XOOM - has significantly dropped price and got a series of updates, which turned a beta-feeling device into a decent deal. You'd still be getting Android 3.1 experience (minus the TouchWiz extras) for €100 less, so it's definitely worth checking out. Of course you won't be getting the marvelously slim waistline or the 565g weight of the Galaxy Tab 10.1 with the XOOM, but on the upside, you'll be receiving cheap memory expansion through the microSD card slot. The EeePad Transformer by Asus has a few tricks in its bag too. It brings a 10.1” LED-backlit IPS LCD display with scratch protection, a memory card slot, Waveshare UI and, most important of all, the optional keyboard dock that turns it into a droid netbook. Not to mention that it also comes at a lower price. Finally, if you have nothing against the Apple way of things and you are ready to sacrifice a few feats (Flash playback and, proper file management and multi-tasking spring to mind) for bigger and better variety of apps and smoother performance then you can get the 16GB Apple iPad 2 3G on exactly the same price as the Galaxy Tab 10.1. As you can see the Samsung Galaxy Tab 10.1 can stand its ground against just about every one of its competitors quite well. Plus it certainly is fun to use and that's a quality valued above everything else in this class.